Domino's Pizza, Inc. is a pizza delivery company in the United States with an international presence. The Company operates through a network of more than 9,000 Company-owned and franchised stores located in the United States and in more than 60 countries. You too can deliver! 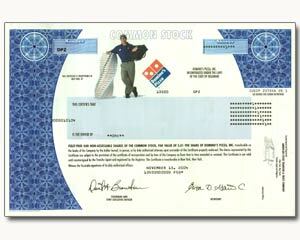 Dominos stock makes a fun gift for the pizza addict.